The Associated Press is reporting that Gov. Kitzhaber will be testifying today before the Oregon Senate Finance and Revenue Committee, to advocate keeping the kicker and to advocate creating yet another rainy day fund. Your troubled cousin asks if he can borrow $1,000 from you to buy cocaine. You tell him no, you’re not going to lend him money for that. He thinks for a moment, and then asks if he can borrow $1,000 from you to pay his rent. In Salem, the Democratic supermajority in the last session cut the K-12 State School Fund by $150 million, and grew the DHS budget by $330 million, while selling Measures 66 & 67 as being “for the kids”. After those measures passed, none of the $150 million cut from the schools was given back. In Governor Kitzhaber’s Feb 2011 budget recommendations, he cut Oregon community college & university funding by $60 million, while growing DHS and the Oregon Health Authority (OHA) by $333 million, and now today he’ll ask an Oregon Senate committee to create yet another rainy day fund that will be paid for by stealing the kicker from corporations – and this new rainy day fund will be for… Oregon community colleges & universities! The same Oregon community colleges & universities that Kitzhaber recommended cutting two months ago, while recommending growing DHS & OHA! Democrats’ strategy: cut school funding, grow your pet agencies, and then justify new taxes because schools don’t have enough money – because you took it! Repeat as needed. Also, how is stealing the kicker from corporations, Oregon’s employers, going to help Oregon attract new employers and create jobs? And that’s just one part of the legislation Kitzhaber’s testifying on today – another part will keep half the personal kicker. If the Democrats in the Legislature and Governor Kitzhaber want to grow DHS and the Oregon Health Authority, then let them make that case to the voters of Oregon. Don’t deceive them by telling them that the new taxes (including keeping their kicker) are for the schools, when really they’re being used to grow DHS and OHA. Stop using schools as budget hostages. Oregon state spending has doubled in the last ten years. We don’t need more rainy day funds, we need spending reform – we need to prioritize spending and we need to stop growing state government. We need to fund public safety and K-12 schools first. As Rep. Kevin Cameron said back in February, “as long as state government resists true spending reform, there will be little appetite among Oregonians to lessen or eliminate kicker refunds”. 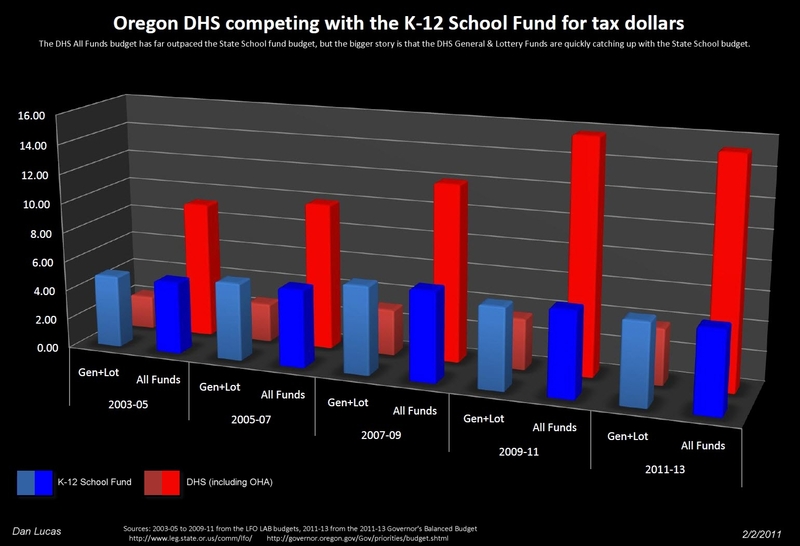 Note: to see the chart showing state All Funds spending doubling from 1999-2001 to 2009-2011, see the July 2010 Harry Esteve article.